How does one get hooked on collecting "Old Iron"? I didn't start out with that in mind. I was born and raised on a dairy farm and had exposure to all types of equipment. I will never forget the big, old Bolens Husky Hi-boy walk-behind garden tractor that we had to handle the garden work. I believe it had a trolley car wheel bolted on each wheel for added traction. The rows were made and the cultivation was done with this machine. One important tool that was necessary to have with you was a hammer. This tractor had a cone type clutch for each wheel and usually one of them would not disengage and require a rap with the hammer. For a youngster of 10 to 12 years old, this was quite a handful. This machine was top heavy on the front and more than once nosed over and kept on going. I have always appreciated anything mechanical, especially old stuff with internal combustion engines. One of the first old things I bought was a 1947 Harley Davidson 61 cubic inch "knuckle-head" shortly after I graduated from high school. After owning it for a year or two, I completely disassembled it, overhauled the engine and transmission, painted it, and had many of the chrome parts re-chromed. I enjoy taking a machine that is badly worn or has been neglected and bringing it back to good repair. I didn't buy my first ROTOTILLER with restoration in mind. I needed a means of working my large garden and the price was right. I was never one to buy new stuff. I would much rather buy old stuff and apply some TLC. After the ROTOTILLER, I bought two small walk-behind garden tractors to cultivate the garden. Both were old, one was already in decent condition, the other was fair. I did some small repairs to them and put them to work. I adapted a homemade snowplow to one (Planet Jr B-8) and plowed my 400 foot driveway for years . A friend ask me if I was interested in two "basket case" Roto-Ette tillers. Of course I was. Here was another chance to rejuvenate a piece of "Old Iron". I ended up making one out of the parts for the two tillers. That is the Model 2 on this Website. Then in the fall of 1999 while visiting the Grease, Steam, and Rust Show in McConnellsburg, PA, I saw something that would forever change me. I saw a display of ROTOTILLERS like I had (Graham-Paige B1-6). I spent quite some time talking with the exhibitor about his collection. He had 5 machines on a tandem axle trailer with displays of all kinds of literature relating to the "Frazer Rototiller". At this point my B1-6 had been sitting in my shed for a couple of years without being run. After the show, I was inspired to get it going again. 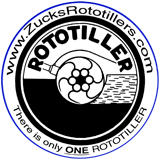 The next spring I attended a lawn and garden show with it and started buying ROTOTILLER literature on Ebay and from vendors at shows. That exhibitor at the McConnellsburg show that got me "hooked" on getting more involved with these machines is Bob Antram, author of The Rototiller Story on this site. Since then we have traded copies of literature and various information and bought the B1-3 that is featured on this site from his son. Bob has quite a collection of attachments for these machines. He has put a lot of time and effort into research on these unique tillers. I decided that I would stay with collecting tillers that were made under or sold by ROTOTILLER. On a trip to get tines for my Model 2, I came across a Roto-Ette Home Gardener with a 25" reel-type mower attachment. The mower was intriguing and I had never seen one on a Home Gardener, so I ended up making another trip to buy it. This Home Gardener was another "basket case", but everything seemed in good condition, plus all the parts were organized in little plastic bags. I got it assembled for the 2001 Rough and Tumble show at Kinzers. The crankshaft in the engine is shot, so it is a display piece only. At this point my collection consisted of a B1-6, a Model 2 Roto-Ette, and a Home Gardener with reel mower. So what started out as a needed piece of garden equipment, has turned into an interesting hobby for me. Almost all of the old garden and farm equipment as its own unique story connected with it. It is sometimes unbelievable the types of attachments that were available for the small garden type tractors and tillers. The more information and pieces I collect, the more I learn about the companies that made them. A great side benefit is the great people I meet at the shows and through my Website. It is a hobby where we help each other out and learn together. Just how many tillers does a guy need when he no longer gardens? Someone said "It's not in the needin', it's in the havin'".